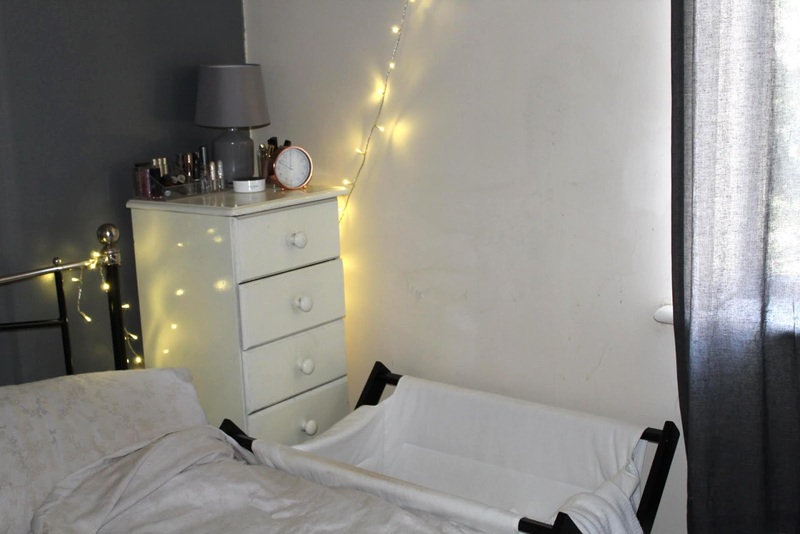 Lack of sleep was the main thing that I was dreading when Fred arrived I had got used to having naps throughout the day as well as a full-nights sleep when I was pregnant that I was worried how I'd actually cope if the baby kept us awake all night every night. 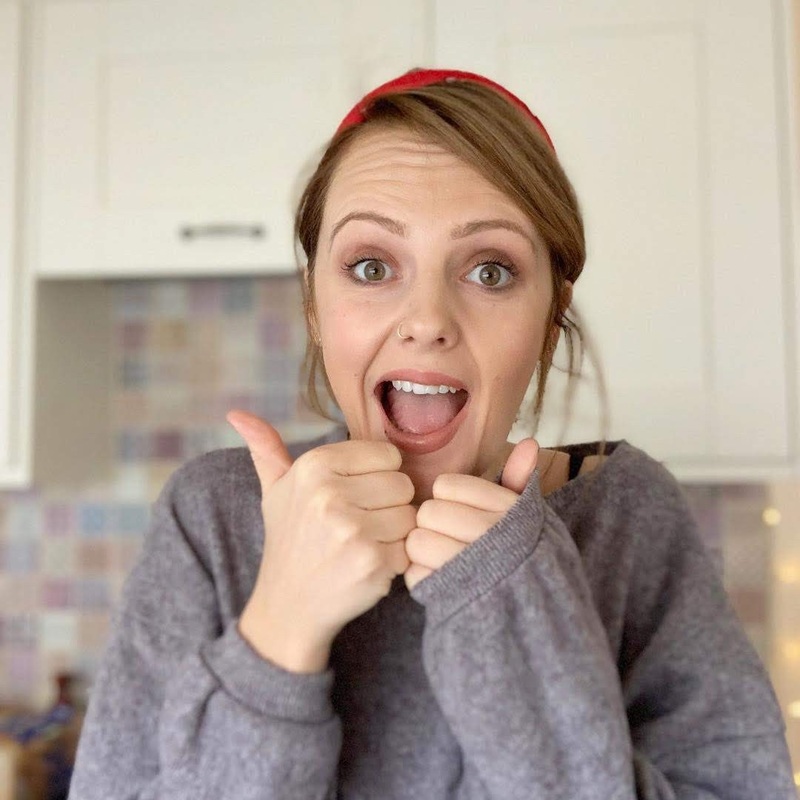 I'd also started watching some family YouTubers and noticed that some were taking 'shifts' throughout the night as their baby wouldn't settle - I winced every time I saw them standing in the kitchen at 3am. 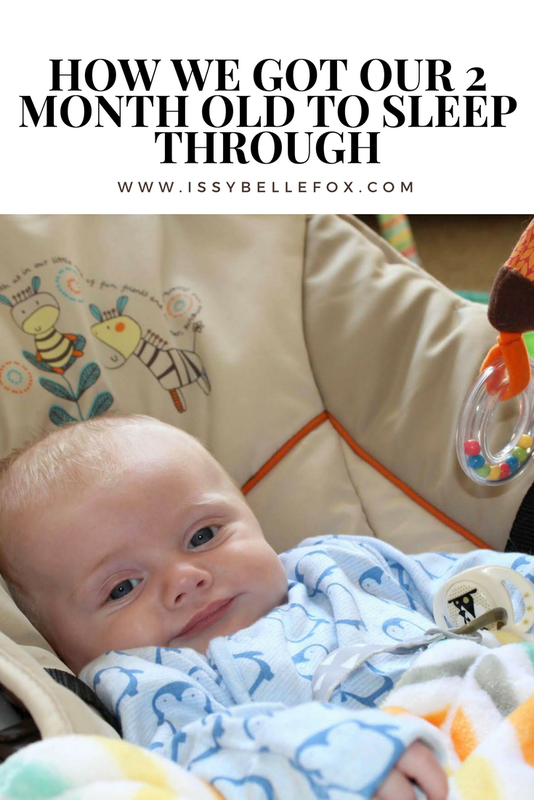 Whilst Luke and I have a relaxed approach to parenting and didn't have any high expectations of how newborn life was going to be, we knew that getting into some kind of routine that worked for us and the baby ASAP was important. I haven't breastfed so I'm not sure how easy this one is but I found that timing Freddie's feeds to a T made sure that I knew if he was grouchy or crying around feeding time that he was hungry and didn't allow him to get too worked up over it. Unless it was a dream feed (more about that in a sec) we also encouraged Freddie to stay awake afterwards, we didn't want Freddie to get into the habit of associating food with sleep and then need to have milk to settle so making sure we sung a song or wandered around looking mirrors to give him a bit of stimulation after a feed was important. 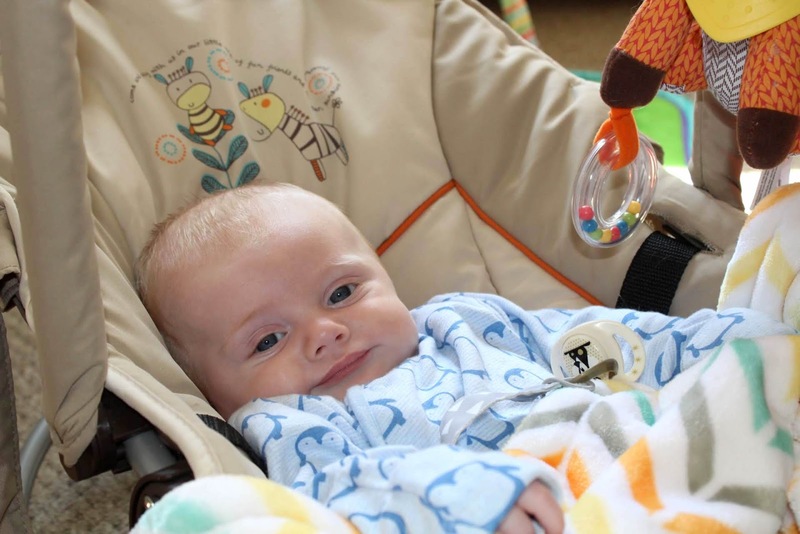 During the first 2 months Freddie woke once in the night for a feed at around 4am, luckily he never fully woke up which meant that we could dream-feed him and pop him back in his bed to sleep. Sometimes he wouldn't wake up for this feed which meant that we would have to slightly wake him enough to drink, this was done by taking the top half his baby-grow off - the change in body temperature woke him up enough to concentrate on feeding and then snugging him back up in it helped get back off to sleep. I found that it was really important to stick to this feed even when it seemed like he could sleep through to make sure that his body clock didn't get messed up. Freddie feeds every four hours and 1-2 of these hours is spent napping; we make sure that he doesn't nap in his bed and sleeps in his bouncer chair or on the sofa (with one of us there before you freak out) again, making sure that his body clock doesn't get confused between day and knows that bed is bed time. Making sure that he does nap is also important to make sure that he doesn't get over tired and grumpy when it comes to bed-time, we do the usual things to get him off to sleep in the day whether it be rocking, singing or letting him sleep on us so long as he gets at least an hour between feeds we're happy and so is he. I hate noise but Luke is naturally noisy, if he's not accidentally bellowing at me he's dropping stuff all over the place and clattering about. He also likes to have the TV on annoyingly loud because it helps him concentrate and he does the same with his music, I think Freddie has always been used to noise so he hasn't had a problem sleeping in loud places but we've made conscious effort to not make a room silent or take him away somewhere to sleep - this means he can nod off wherever and whenever and not be cranky when we get home. I tried creating a really relaxing bath time and bed time routine for Freddie as I'd seen it work for so many people but it had the opposite effect on him; Freddie gets all fired up during a bath and is wide awake afterwards so our baths happen in the morning when we're getting ready for whatever we have planned in the day. Freddie takes between 5 and 6 ounces every 4 hours, these hours used to be dependant on him but now he's bigger and I'm more confident, he gets fed at set times and I happily wake him if he's asleep (which doesn't happen very often anymore as he's tuned into the routine). We give him 8 ounces for his last feed at around 10pm to tide him over during the night - he then sleeps until around 6:30am and after a quick nappy change has his first bottle of the day. I also prepare the bottles for the next day the night before. We keep all the sterilised bottles and fresh water in the kitchen and have the next feed ready on the coffee table with his powder measured out and the infacol at hand - I've mentioned this before but we're really lucky that Freddie prefers his milk at room temperature, this means we can easily feed him and don't have to heat bottles. Freddie's bed time routine is really simple, once hes had his last feed I'll give him a little snuggle on the sofa to say goodnight and then put him in his bed, we start quietening down from about 7pm and Freddie is usually napping in his chair by this point by bed time he's really calm and knows whats happening. Once he's in his bed we try not to fuss him at all, if his dummy falls out and he seems bothered about it then we'll pop it back in his mouth but we mostly leave him to self-sooth. He doesn't cry but can wiggle around quite a bit if he's not quit ready to sleep or sometimes he'll just lie there blinking away, it's when he's still but lying awake that I have to fight my urge to go and keep him company but he's in such a good habit of getting himself off to sleep at night time that I don't want to ruin it. We have a few tricks up our sleeves if he's having a tough time with getting off to sleep; in true millennial style Freddie has an Alexa Dot in our room and the Amazon lullaby station is perfect for when a little sound is needed. We also have a star and solar system light projector that is really relaxing and helps create a calm environment. So there you have it, they're the key things we've done that I'm sure have contributed to Freddie sleeping through and allowing me to have a good old rest and him to be a little ray of sunshine each morning.